The legendary Dr. Don visits the Stockton studios of KSTN (or is it KTSN?) to record station IDs, with Paul Shinn producing. The original Daddy of Doo-Wop takes the KSTN all-night show into the early morning hours. One of the staples of KSTN's Sunday morning schedule for many years was its block of Gospel-oriented programming, including "The Hour Of Praise," hosted by Rev. Crosby, and "The Glad Tidings Message," portions of which are heard here. Program director John Hampton and chief engineer Paul Shinn lay KSTN/1420 to rest. The La Poderosa format ends, abruptly, on KSTN-FM a few seconds past midnight (actually early Saturday morning). 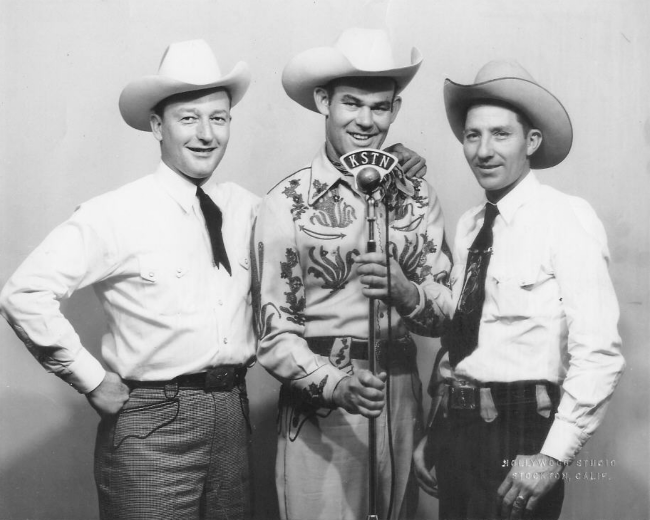 SOURCE INFORMATION: Photograph of Bud Hobbs at KSTN by courtesy of his niece, Brenda Wattenbarger, from her tribute to Bud Hobbs & His Trail Herders. Audio marked PS provided by courtesy of Paul Shinn.